Time and Space - Again! If we go the route that David created the thousands of eggs on LV-426, what must be deduced about the speed of a juggernaut? It took David and Shaw about a year to reach Planet 4 in the juggernaut (and Shaw had to be placed in cryosleep). With engineers technically more advanced when it comes to space travelling, their ships must be able to travel very fast and over huge distances? Despite the juggernaut, most likely travelling many, many times the speed of light, it still took David and Shaw about a year to get there! The best scenario would be that Planet 4 and Origae-6 is in the same direction as the Zeta2 Reticuli system. If they were in the opposite direction (or in a 90° direction) it would, most likely, be too far off for David (or an engineer) to get back in time since the happenings on LV-426 happened 18 years after the incidents on Planet 4. To get to Origae-6, it’s about another 8 years for The Covenant ship. After getting to Origae-6, that leaves, roughly, another 10 years for David to perhaps start a colony (of xenos), create the eggs (unless they aren’t already created on the ship) find a juggernaut, store all the eggs in the cargo hold, and get back to LV-426. Still, according to my humble calculations, David (or someone else) would have sufficient with time to get from Origae-6 to LV-426 since it would take approximately 2 years for a juggernaut. That would give David about 8 years to experiment and other things to happen on Origae-6. So, if there certainly are other questions in this scenario, time and space wouldn’t be a problem? 38 Responses to Time and Space - Again! Thank you chli for trying to tackle this. Although not considered canon by many, there is a special thanks to a 20th Century Fox rep in the credits Prometheus: Life and Death Final Conflict comic. So, I read into this as "some" coordination on content. The juggernaut in the comics showed the ability to transport to another place and time immediately. This reconciles with David saying "10 years ago" when talking of arriving to Planet 4 to the Covenant crew. I know much of what he said was an obvious lie but he said it...so it's very hard to nail down where Planet 4 actually is. If, as you suggest, a juggernaut can transport itself to another part of space (and time??) immediately, then it would, of course, be interesting to know what David’s been up to for the 11 months it took to get to Planet 4? Do you have a link to the Time-line? Can we take this as accurate? As far as i am aware we have not in the Movie, or Material related to DVD/Blu-Ray or Novels got a date of departure for the Covenant ship. David and Dr Shaw left we can assume LV-223 on January 1st 2094, the events of Prometheus happen at the end of 2093 and so 11 years prior to the events of Alien Covenant. David claims he was on Planet 4 for about 10 years, this could be less or more than 10 years... A thing to notice is The Crossing, we see Dr Shaws Hair is longer and unless this is a Ridley Scott Oversight it has to mean that DR Shaw had spent 4-6 months pondering putting David back together before she actually did. Ridley Scott did say prior to AC that she would slowly put him back together. So the Juggernaught would have taken about 6-9 months to get to Planet 4, but we dont know 100% what David did in his time after he put Dr Shaw into Cryo-sleep to when he set off to Planet 4. He lied to Dr Shaw, so that she would in effect be incapacitated and leave David Free to pursue what ever Agenda he wishes. We thus have no knowledge of how FAST a Engineer Ship is, i would assume they can Travel Vast Distances due to the Fact they have other Galaxies in their Navigation Systems... which means that Interstellar Travel is vastly easy for them. Prometheus was able to Travel at about 20X Speed of Light, the Re-fitted Nostromo about 47X the Speed of Light, i think we can assume the Covenant is Faster than the Prometheus, but its hard to say if its Faster/Slower than the Nostromo. I think it would be safe to assume that Origae-6 has to be at least 3-4X Further away from Earth than the Zeta 2 System. But it could be way more than that.
" then it would, of course, be interesting to know what David’s been up to for the 11 months it took to get to Planet 4?" I can only assume a period of this time was spent while Dr Shaw pondered putting David back together again, her Hair Growth would take most Females 4-6 months, and then the other time could be when DAVID was learning the Engineers Ways. Once Dr Shaw was in Cryo-sleep, then David could have the freedom to go where ever he wanted.... we discussed this prior to AC and so he could have gone to LV-223 again, he could have gone to LV-426 to get some Eggs... (this now seems unlikely if David created them). He claimed the Derelict did not get FAR from its Departure, now this hints at its departure being LV-223, but it depending if we are talking FAR as in Distance or Time... 10 Miles is a bit far to Walk it would take about 3-3.5 hours to walk... But in a Car its 10-15 Minute journey. So even if we consider that the Space Jockey event is not Ancient, if we consider the NOT FAR as in terms of the Travel in Time for the Derelict then indeed Oriae-6 or Planet 4 to LV-426 could be considered not FAR... but then it would be a coincidence if it was going to some other place and just happened to only get as far as LV-426... Unless LV-223 was its destination but then RS comments would make not sense because it would not be NOT FAR, but actually just before its destination. It would also make sense with RS comments about returning Engineers to Planet 4 who come and go and certain times, if these Ships Travel really fast so say to Earth in a instant.... this means those Returning Engineers are in the Far Reaches of our Galaxy, or another Galaxy or they spend many years doing what ever they are doing and then the Travel to Planet 4 is not so long, but what they are doing takes many years. To me, it doesn't seem likely that Shaw would wait 4-6 months until entering the hypersleep chamber. The engineers can hardly have left anything edible considering 2000 years have passed, so Shaw has to leave the safety of the juggernaut and go back to Miss Vicker's life support shuttle. Well, I wouldn't. I'm not sure which I would rather meet: an angry engineer or a trilobite? As a matter of fact, if she had gone back she would be dead because of the deacon (bear in mind how the neomorphs reacted when they were small). The most rational thing for a scientist is probably to come up with a decision fast and then hope for the best (in retrospect she made the wrong decision and assembled David)? I have checked that site out, and the source they claim is The Crossing however the Crossing does not give any dates at all, only about 2093 and the Prometheus mission. So the January 1st 2094 has to be a rather large assumption, i will need someone who has read the Alien Covenant Origin Novel to confirm any dates as i have not read or have this book. The only thing we have really is that the ending of Prometheus we have Dr Shaw heading off with David in Two Pieces on the ATV Buggy heading towards another Temple Complex for another Juggernaught where she relays a SOS to Warn People that only Death is there now... the date of the recording is January 1st 2094, but we dont know if this recording was taken prior to the Buggy Scene, or after or during. 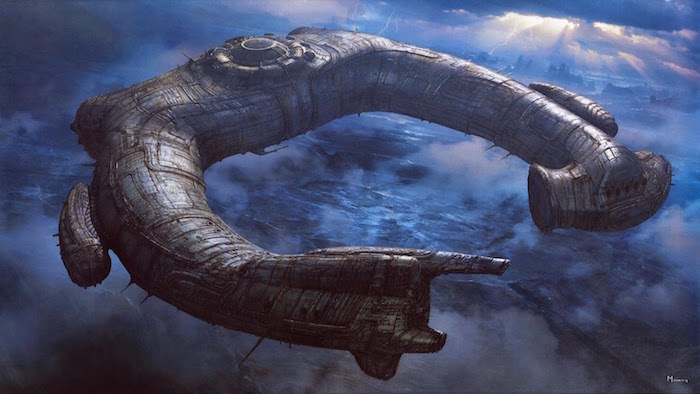 The next Clues we have is the Arrival of the Covenant Ship... which indicate 5th December 2104 as when the Covenant Crew are awoken due to the Neutrino Blast. I have not read the Origins Book... i will have to dig it up, unless someone can confirm information.... So all i had to go on was that in relation to the OT is that there simply is NO Dates of when the Juggernaught Arrived at Planet 4, as far as i am aware. Regarding Dr Shaw, and the wait... you would indeed assume she would want to get the HELL away as fast as she can, and not risk going back to the Lifeboat. It appears a big question for Dr Shaw is TRUST regarding David, she knows she would be taking a HUGE risk in putting him back together... Ridley Scott even mentions this when disusing potential Prometheus sequel... He further explains that David can be very confining and that Dr Shaw SLOWLY puts him back together. Yet the SOS message was sent January 1st 2094 and so this was sent 5-6 days after she recovered Davids Body, we have to ask what was she doing for 4-6 days, how did she manage to send a SOS? The Prometheus is destroyed.... was it via the Juggernaught they found either on the 1st of January or after this date? Communications Equipment in the wreckage of the Prometheus? Or from the Life Boat... or the ATV Buggy had Communications it could send out the SOS? The Crossing shows that Dr Shaw has some kind of Nutrition she has been taking, is this on the Engineers ship? if not then enough of this on the ATV? Found in the wreckage of Prometheus? or from the Life Boat? We also see Dr Shaw has managed to get some Tools to Repair David, a Bed, recovered a Photo of her and Holloway (shown in AC) did this come from the Wreckage? what are the chances of this? or the Lifeboat? We also see Dr Shaw plotting a Course using a what appears to be a Physical Star Chart, surely David could Navigate using the Juggernaughts Controls/Navigation System... This Chart seems odd for Engineer Technology, and so if its Human Star Chart then where would it come from? i think all of the above shows that Dr Shaw must have gone back to the Lifeboat to Salvage stuff, this explains the 5-6 Day delay.. a Question is what about the Deacon... but Dr Shaw is not aware of this and i am not sure David would be either, and so Dr Shaw just left a Engineer and Trilobite struggling. Dr Shaws Hair has grown at least 4-6 inches (yep i measured the difference a few times before lol) that was being conservative, and a Woman would grow 4 inches in 4-6 Months it depends person to person.. if her hair had grown 6 inches then thats 6-9 Months... i will have to double check again... work out the hair growth and average for growth again. Looking at it Logically.... Dr Shaw needs to Trust David, and David needs to gain her Trust, Dr Shaw would be wise to take her time and so its likely she spent 4-6 days recovering from the Prometheus Wreckage and Lifeboat all the Equipment she had in The Crossing maybe even finding communications there to send the SOS.... She likely then got David into some kind of Agreement to take the Ship to Out of Space... or left in Hanger. I have not read it so i cant say this is incorrect.. Looking at what they say next, indeed the Date of the Covenant Neutrino Burst Disaster is December 5th 2104 and Walter does say about 7 Re-Charges until Origae-6 which would take 7 years and 4 Months so Origae-6 Arrival Date is Estimated as Early April 2112. Now 7 Recharges we cant be sure when they take place... the remaining Journey Time had the Re-Charge Been Successful would have been 88 Months, Divided by 7 is 12.57 Months... but this does not mean that per charge.... as the last Charge could be months prior, what this shows is the Covenant has to Charge at least ONCE per Year. But the Ball Park for the Covenants Departure would have to be December 2103-March 2104 latest. I do like the sites assessments, i will have to look at other stuff so THANKS for the Share.. I still find no Proof for the Departure of the Juggernaught or Arrival to Planet 4, until further Proof or Study i would have to assume the Travel would have been WEEKS to up to 6 Months. Clara has used large chunks of my timeline which she links to at the top of her page. She's also made some estimates of her own with things like Advent (which from memory is not dated). Other dates she has referenced regarding Covenant refer to an earlier version of my timeline which had since been updated. Indeed had a quick look, and some is sourced from what we know about movies, some from DVD Extras... some from other material such as the Weyland-Yutani Report. I think its tricky to get a TRUE timeline with all the changes that keep happening, and the case of whats Canon/Not Canon as far as some expanded universe books and games.. The Weyland Industries Website offered some good back ground, as well as some extras for Prometheus... but it kind of appears that with Alien Covenant they have been Re-writing a bit of History. Hopefully with the supposed ALIEN Rulebook as a refference for the Franchise, we can see down the line another Book like the Yutani Report... one that once the Prequels are done i am sure we can finally get a comprehensive versions.. not saying yours is bad... but only so much that can be done while FOX working on extra material that would be released after the Yutani Report went into Production. Regarding the Events in Question, having not read the Origins book and so not knowing what date that was set in, did mean i could not conclude the events of the Covenant... i felt a while back and prior to that book, that the Covenant had to at least have set off from Earth for about a year... and no way longer than 5 years due to the Merger... I estimated prior to the book the Covenant would likely had set off 1-3 years prior. But taking the information about the Missions Final Preparations in December 2103, and other clues in AC as Clara had done, then i cant argue against the estimates as far as Re-Charge Cycles... which would mean a 11-12 Month Ball Park and thus a December 2103-January 2104 departure date. I cant find any proof for the date of the Juggernauts arrival on Planet 4 however... or departure from the LV-223 System, David claims he has been there for 10 years... which would indicate since around December 2094 but then when someone says 10 years it really could be within the Ball Park of +/- a few months too. Evidence only suggests Dr Shaw made the Transmission on January 1st 2094.... the movie is a bit ambiguous but if we assume that events are chronological i.e David and Shaw set off in the Juggernaught prior to the Deacon, and Dr Shaws SOS was made during her Final Trip to the Engineer Ship. Then this means the Deacon had a 5-6 day Gestation at very least... which gives Dr Shaw plenty of time to gather supplies... She does not know what the Deacon or Trilobite are... all she witnessed was a Giant Tentacled Beast Grab the Engineer. If she had gone to investigate she may have spotted what looked like a Dead Engineer and Dead Trilobite and so maybe felt a bit safer to quickly gather supplies. But i still think its likely that David was not Re-built until at least 4-5 Months minimum maybe even 9-10 months after the events of Prometheus. Having Studied Dr Shaws Hair from Prometheus and the Crossing, it appears (hard to gauge 100% due to her hair not being straight) that her Hair is 4-6" Longer towards the front as far as be the sides of her head (not Fringe) and 6-8" at the back of her head. I looked at Photos of her from Summer 2016 and movies she had shot around the time prior to AC finished shooting and next project after. And compared to shots of her in 2011 at time of Prometheus. And her Hair Difference is between 6-8"
I we assume her Hair Growth to be a conservative 6" and the Average Growth of a Female Caucasian is 5-7" per year. So i think we can assume for Noomi Rappace to grow her Hair Naturally from the Length in Prometheus to the Crossing, it would be about a year. This can not be used as any FACT to how long Dr Shaw had remained out of Cry-sleep before she put David back together, but only if we assume this is not a Oversight... then Dr Shaw's Hair Growth would be about a year give or take. I think this fits with Ridley Scotts comments of she will slowly put him back together, and his warnings and caution about how Dr Shaw would have to be very careful because once his head goes on he is Dangerous... but he is Persuasive. I find it Plausible that they spent many many months, before Dr Shaw had built the trust to a point where she felt SAFE to put David back together and for her to enter Cryo-sleep. But alas it could be a oversight.... Rappace was maybe Cast for the Crossing between working on TWO Projects or During, where she had to have the longer hair she had. This also ties up any queries about what David did in that time and how long it took, because if think its more Logical if Dr Shaw finally went into Cryo-sleep and David to then spend up to 2 months to get to Planet 4, rather than assume it would take the Juggernaught 10-12 months. At this point i would assume maybe indeed Dr Shaw had spend a long time before she puts David together and so David departed for Planet 4 i would say 2-4 weeks... prior to the Bombardment. But again this is just a assumption taking into account Hair Growth that would take a conservative estimate of 10-12 months. We simply cant tell how far it is though.... if we assume the journey would have been 8 years 4 months then at the Speed of the Prometheus this would make Origae-6 in the 160-170 Light Year Ball Park and thus over 4X further than LV-223/426. I am not sure David would take the Covenant to Origae-6 and then to LV-223, i think its likely the direction is David arrives on Origae-6 in 2112.... likely help to set up the Colony. I think a Engineer Ship that arrives to Planet 4, will then be on a course to Origae-6 but due to speeds of the Juggernaught i would assume that David would at least be on Origae-6 before any Engineers return to Planet 4. I think its likely a Engineer Ship that arrives at Origae-6 after 2112 will set up part of the events that lead to this ship ending up in the LV-223/426 system at some point latter. The Company will receive Davids Message i believe about 1.5 years after it was sent. We dont know how fast and what urgency a Weyland Yutani Ship would then be off to Origae-6 and we dont know how fast those ships are... but we can ASSUME they will not arrive until David has been there for some time. So if Shaw waited at least a few month to fix the Psycho, wouldn't that infirm the theory that she was still infected (after removing the sperm monster)? And where the hell is the synth's power supply? I could understand that it has in the head some emergency batteries in his head, but how long can they last. Furthermore, if David remained alone on Engineer Ship a few month why did he complain the he would be alone again (as he was alone more than 2 years before Prometheus)? And what in the hell did Shaw do for those months awake? She wanted to ask questions but why didn't she study the ship's archive? "Which i can safely assume SM you had to collaborate with FOX regarding extra things added to that..."
Not as such. I add the extra dates and explain the reasoning behind them. Fox is generally okay with that reasoning if they need to reference dates. "But what do I know, I am just ignorant..."
A lot of times its down to simply not paying attention to details, one example is "where did Shaw get the Photo of her and Holloway from, that Daniels discovered?" was it by pure luck in the wreckage? if not then why would it have ended up in Vickers Lifeboat.. So its little things like this, that have no explanations that we can just try our best to find some. "wouldn't that infirm the theory that she was still infected"
Its something debated for sure, something we dont have no evidence really of if she was or was not suffering from some kind of infection. some point out to her not looking too well in The Crossing which indeed could be down to her being ill, she looked it but then if it was the Black Goo, we have to really ask what kind of infection has she got, would it not act fast or does she only have minor residue left? The other way to look at it would be having to Survive for Months on Rations of Food/Drink or even having to make do with Nutrition that simply was not good enough. "I could understand that it has in the head some emergency batteries in his head, but how long can they last"
Maybe he uses the UK Brand Duracell lol but seriously the Power Source is a good Question, he would have to have TWO Power Sources because being in TWO Halves had no effect as both his Body and Head were still moving... but maybe the body would eventually had ran out of power if it was sourced from the Head. i am sure the Weyland Industries Website had information on the Technology in David and mentioned Power Source but as of Alien Covenant this site re-directs to Alien Universe site now, with no such information. We do have to wonder how was David Charged up and Powered, and what Technology is needed to Re-charge him if needed? This is just a Oversight, because we can see David has survived on Planet 4 for 10 years too.. He also was consuming that White Fluid in Prometheus, and we have to ask, what purpose was this for and how would he have access to any after Prometheus. So indeed he has had no Maintenance in over 10 years. With no explanations to how this effects him, it simply is a oversight. (a question we should not be asking or deemed one that does not matter). "why did he complain the he would be alone again"
I think it depends how we look at this statement, being alone again could be something you could say for even a short period, so its like your partner works 4 days away then is home for 4 days, and when they leave you could be saying "you are alone again" and so with David he spent some of his time alone studying the Engineers Ways. "She wanted to ask questions but why didn't she study the ship's archive?" David would have his Agenda, he surely would not be pleased at remaining as a corpse with a separate head, because we find out David actually is quite a sentient being, more than a Machine. And so he knows without Dr Shaws Help, he will remain in TWO pieces, and so he has to play a good game to make sure he can persuade Dr Shaw to put him together but also to make her realize or even mislead her that in order for her to get her Answers, and arrive at Paradise she would need David all the way. Dr Shaw however is not fully aware of how Sentient David is, she would indeed however have seen what he was like in Prometheus and would have concerns about him and trusting him, but she realizes she needs David to get off that Rock and take her to meet her Makers.... Its a case of really how much is David needed? I am sure David holds all the cards in this case and his objective would be to lure Dr Shaw to realize he is needed. David would not reveal to Dr Shaw anything about the Engineers if he could find out from the computer, i think he would be playing to mislead her, because if She could get her Answers from the Ship, then she would not need David so much. Shaw would know once David is put together he could be a massive threat, and once she is in Cryo-sleep he could go where ever he wanted to go... Shaw is powerless but to eventually either Trust David, or Stay stranded on LV-223. i think its likely David played this game with her, persuaded her to have trust in him.... but i think during this process he actually became quite fond of her... But Ultimately he would have his own Agenda more over hers. David would have known a bit about the Engineers already, he would know they maybe would not see the arrival of a Human and a Sub-Created Android as something to welcome with open arms. Davids interest would be Survival, and also making sure that Dr Shaw survives, he would not maybe risk meeting these Engineers on the chance they would welcome them... for Dr Shaw she would be prepared for that risk, if its the only slim chance of Answers, she has NOTHING else. so for David he would want to Study More about the Engineers so he can gauge what is the likely outcome of meeting them, which seems that David concluded he would be better off to Destroy them, knowing that in the aftermath he could venture down through their City, take a look at any of their Technology, Writtings and any other information he could gain from the Ruins of their Society and maybe piece together some Answers for Dr Shaw, or at least something he could propose as answers and you could maybe be sure he would have told her he had no choice to bombard the Engineers, or it was a accident etc. But again this is really just how i see things, and so its not to say this is what went down... I think its something open to debate, where each can take what they can from any clues, because the only real information we have is that David had been there for about 10 years so thats 9.5-10.5 Ball Park (providing he has not lied to the Covenant Crew) and we know the Earliest the Juggernaught would have set off would be Jan 1st 2094 and so that means we have a 10-11 year period of time prior to the Covenant arrival, from when David and Shaw reached Planet 4. Its case of the 0-1.5 years year approx from Jan 1st 2094 to when they arrived at Planet 4 and how much of this time was spent Traveling, how long was spent for her to Put David Together and Dr Shaw go into Cryo-sleep and a IF David then directly headed to Planet 4. Where did he learn the Engineers Ways? From the Juggernaught?, did he already know enough from LV-223 or could he had gone back down to LV-223? You could say however that images where David's lies, but that for me is not working. Inconsistencies made br2049 much less enjoying for me than for others. Ignoring strict adherence to timelines keeps the franchise enjoyable to me. Too many cooks over the decades. I can appreciate those who focus on those issues though. "You could say however that images where David's lies, but that for me is not working." I would like to think and hope The Crossing is Canon and so indeed at some point Dr Shaw has some idea how to control the Juggernaught, which i think we can assume David had taught her. Its a good point you make, because if we look at the Crossing then it offers us TWO Outcomes. 1) Only a Complete David can operate the Juggernaught (or at least he misleads Dr Shaw to think) and thus Dr Shaw repaired him prior to leaving LV-223.... which then its if we consider the Hair Growth to show they was stuck on LV-223 for a while. 2) David was able to show/help Dr Shaw in Two parts to be able to get the Ship off LV-223, but then we have to ask why would Dr Shaw need to repair him if a David in TWO pieces can operate the Ship. why i think a lot of Cat and Mouse and Compromise had to be reached, but i feel David was playing Dr Shaw and he misleads her to think she needs him more than she maybe did. Isn't funny how this movie generates more talk about a killed-off character than the living ones? Is that even a good thing? I think a lot of fans relate to Dr Shaw as far as a keen interest and what she would discover, and even though in Alien Covenant we see her just as a Corpse, i think the whole mystery to what happened to her, and what happened on Planet 4 between her and David as far as how long was she alive before she became a experiment of Davids. its the same with the Engineers, fans was looking to discover more about them, but in AC we hardly get much about them and so fans still talk about their race, ponder what happened to all those Engineers, and why they appeared different. I think we can conclude the Juggernaughts must travel much faster than Human Ships, i would even expect a Juggernaught to reach LV-426 from Earth even faster than the Sulaco. I think if we take the events of Prometheus as Chronological so the Deacon Chest Bursts after Dr Shaw leaves that SOS warning about only DEATH is there now... then that gives us at least a 5 day Window, between when Dr Shaw escaped the Lifeboat after the Engineer was attacked by the Trilobite, to when she at least made her Final Trip to the other Juggernaught. Entering the Lifeboat between the Deacon Gestation time, Dr Shaw would see what appears to be a Dead/Incapacitated Engineer and Dead/Incapacitated Trilobite and this could give her enough time to make a dash to get supplies we saw her with in The Crossing, as well as some of the items David had in Alien Covenant. We know that David had been on Planet 4 for about 10 years, and the Covenant Arrives about 10 years, 11 Months after Dr Shaw makes the SOS Warning in Prometheus.... but as far as how long it took her to put David back together, and Ultimately how long it took to get from LV-223 to Planet 4 is something for debate. We currently as of Alien Covenant, are over 17 years off the events of ALIEN, with the Covenant Estimated to arrive at Origae-6 (provided it heads directly to Origae-6) in about April 2112 which leaves us about 10 years off the events of ALIEN. We have to assume David takes the Ship to Origae-6 and then as far as what transpires during the 7 years 4 months journey, and more so in the first few years after arriving at Origae-6 is anyone's guess. I think we have to assume RS had planned TWO movies to cover more than likely the events of 2112-2122, i would say it appears if we are going the route that Davids Creations are what eventually end up on the Derelict... then this ship looks like it has not crash landed there for a short period of time, so we SURELY cant have it that the Derelict Crashed Months prior to the Nostromo Arriving? But going this route means the Derelict cant had been there for more than 10 years, we could maybe assume the Derelict may have been there for say 4-5 years at very least.. But we really dont know for sure yet.... I doubt we will see David arrive at Origae-6 and then in the course of a few months or a year we end up with the Derelict. I read Alien Covenant: Origins some time ago, and after having browsed through it again, there are no dates at all in the novelization. However, there is one interesting thing connected to date: Weyland-Yutani knows that Sir Peter Weyland is dead (and The Covenant leaves after this). This must mean that they have received Shaw’s message which was sent somewhere between December 25 - January 1? This, in turn, probably means that The Covenant left Earth orbit sometime in January at the earliest and therefore has travelled for only about 11 months until reaching Planet 4. This would mean that Planet 4 cannot be too far away from Earth and that The Covenant must be pretty fast? Not necessarily, however. Maybe only a very small Cabal knew that Weyland fake his death, and he was on the Prometheus. But I have not read that novel so there might things that I don't know about, and your interpretation is spot on. I am going to have to try and get my hands on the Novel. Nice or you to confirm there are no Dates given, which puzzles me now to where the "1 January 2104: The Covenant launches from Earth orbit" came from but a number of other information from that source does not add up either. Now that cant be so, because we see in Alien Covenant when they detect the Signal after the Neutrino Burst Accident, they faced TWO options... continue on a 7 year 4 Month voyage to Origae-6, while the Crew are reluctant to go into Cryo-sleep.... or check out the source of the Signal which would be a 7 week Detour.. Looking at the Covenant from what i gather the Events occur from December 4th/5th in regards to the movie, so the Signal would have had to been detected about 16-17th October. Again i will have to look at the source material that we have as far as Viral Videos for information, or unseal my DVD for the extras. We have seen a Time-Line for the Merger as in the year 2099 this is from the Yutani Report, and i guess SM can clear up where this date came from.... i.e FOX etc, or if SM suggested it and FOX went along with it? My Prometheus 2 i was working on, had the Merger happen 25 years prior to ALIEN. But this is just Fan work, where i had it happen under 3 years after the events of Prometheus. If the Origins Novel has no dates, then we have to see if any are given in any Art of the Film books or extras... as far as the Covenants Departure Date etc. Confirmation of this is interesting, but it could have some explanations, we have to assume that the Company had more than Vickers and Weyland as far as Board Members, and its strange to send your only TWO Heads of Board with no Contingency plans. So we could speculate that someone at the company or indeed any Medical Personnel who had interacted with Weyland in his last few years, MAY have knowledge that Peter Weyland was a dying pan who has only a short time left alive. I think its logical a combination of the Mission being missing in action, with a certain amount of time with no reply and being 2 years away from Earth, with anyone who knows Peter Weyland has not many years left in him.... would be able to conclude Weyland would likely be Dead and thus classed as Deceased. If this is not the case... and thus the information regarding Weylands Death is confirmed by the Prometheus itself, be that the detection of Dr Shaws SOS, or/and a investigative mission. Then this would indeed lead to us to suspect those behind the Merger would indeed be aware of the Prometheus mission and likely what it had encountered. It depends which of these outcomes is what happened as to give us a date where the Merger had not taken place... The Questions come down to. * How long would that SOS Signal by Dr Shaw Reach our Solar System or some distant Outpost/Ship that can relay the message to the Company. * How long would the company wait before sending out either a mission to LV-223, or at least try some communications. Then its a Question of how fast does Communications work, and how fast could a investigative mission take? The same 2 years as Prometheus? The remaining Journey Time meant the Covenant would arrive on Origae-6 around April 2112... so a 8 year Journey would mean a Departure of April 2104 which if we assume the Re-Charge was its first then this would have taken place after 8 Months (assume Dec 5th Neutrino Blast) or just over 6 Months if we assume the events of arriving at Planet 4 by the Covenant was December 5th. Which would mean 11-14 Re-Charge Cycles within the next 7 years 4 months..... Which Logically means the Actual Recharge Cycles must be 11-12 Months (ASSUME The Re-Charge was December 4th/5th). so that means about a 99-100 Month Journey Total, thus the Covenant Traveled about 12% of its journey before Re-Charging. "This would mean that Planet 4 cannot be too far away from Earth and that The Covenant must be pretty fast?" This is the Big Question with NO given Distances, we can only have wild Guess work... If the Covenant is as fast as the Prometheus then Planet 4 would be about the 18-21 Light Years away Ball Park. if the Covenant is as fast as the Refitted Nostromo than Planet 4 would have to be around the 42-50 Light Years away Ball Park. We can assume the Covenant is not as fast as the Sulaco, but we really dont know how fast the Covenant is, i would assume at least as fast as the Prometheus, and i doubt twice as fast as a refitted Nostromo. Which means a 20-100 Light Year Estimate? So that does raise a Good Question about the likelihood of other Human/Earth Missions to Planet 4 after the events of Alien Covenant. If we look at the Juggernaught ships, i think we can safely assume they can travel much faster than Earth ships, but we just dont know how fast they actually travel. The Comics appear to suggest they can travel certain large distances within a instant.. But i am always looking to look at Movie related Evidence or connected Viral Marketing/DVD extras rather than Comics. While we do-not know how fast the Engineer Ships are simply because we have NO Data to go by, all we can go by indeed is that David had been on Planet 4 for 10 years, that could mean he arrived about December 2094, but again its how do we read into ABOUT 10 YEARS this interpretation depends person to person, for me i would say regarding years that i would be looking at saying something either took 2 years, 3 years or 2.5 years, so if something took 1 year 5 months i would say that its about a year and half, if it was 1 year 10 months i would say about 2 years and if it was 1 year 3 months i would say about a year, or just over a year. so in that context, and this is just how i look at how i define time, i usually split it up into Quarters and so 12-15 Months i would class as a about a year or just over a year, 16-20 months i would class as either about a year and half or just over/just under 1.5 years and 21-24 months i would class as about 2 years or nearly 2 years etc. So by that then David being on Planet 4 for about 10 years would mean he has likely been there since December 2094 give or take a few months so we can safely assume (unless he was lying) that David arrived at Planet 4 likely around December 2094, but certainly within the 1st October 2094 to 28th February 2095 Ball Park. But as we dont know how far Planet 4 is we cant estimate any kind of Speeds, all we really know is that David and Dr Shaw had definitely left LV-223 at very least January 2094 but due to the Hair Growth with Dr Shaw, i would Safely Assume a Period of Months had past. I think the best estimate looking at the clues for me would be that David Arrives at Planet 4 between October 2094 to February 2095, but lets just go with DECEMBER then looking at Dr Shaw's Hair by the time she entered Cryo-Sleep i think it would appear this had to be again October-December 2094 and so i think the Juggernaught could travel to Planet 4 within a matter of weeks, certainly no longer than 6-8 weeks. When we look at the JUGGERNAUTS STAR CHARTS we see they have many Galaxies in their System, we would have to ask why if they CAN-NOT Travel to these places... The Nearest Galaxy to our own is 2.5 MILLION Light years, thats Vastly further than to LV-223, so the Prometheus would take 125'000 years to get to our Nearest Neighboring Galaxy. We have to Assume the Engineer Ships can Travel beyond even that Galaxy because it had Many in their Navigation Systems... but we still cant gauge the Speeds off this.... if they could reach other Galaxies within years, then reaching places like Planet 4 would take Minutes. This is where the CRYO-PODS come in, if the Engineer Ships can Travel to Earth/Planet 4 etc within weeks, then we would have to wonder why the need for Cryo-Pods? I would assume they are used for Longer Term Travel to distant parts of the Galaxy. so we still cant really get any information on Juggernaught Speeds, i only assume they could get from LV-223 to Planet 4 in relatively short time, which begs the Questions then... why did not ships return within Thousands of Years? so indeed its highly likely that David would not only reach Origae-6 but also that some Colony would be set up, prior to the Engineers returning to Planet 4.... In my idea/plans for Alien: Ascension (Covenants sequel) i indeed have David arrive at Origae-6 in April 2112.... i have the Engineers returning to Planet 4 10 years after David departed. so in the year 2114. The dates we have from the Prometheus expedition are 21 December 2093 (David walking about on the ship). 25 - 26 December (everything happens). 1 January 2094, Shaw drives away from the facility they have been exploring (in the buggy, and presumably with David still in two parts?) towards a juggernaut in the adjacent facility. Shaw sends the message and they leave 1 January in the juggernaut. As they leave, the deacon is born, giving a gestation time of about 6 days (26-1)!!! They have had plenty of time scavenging things, but the gestation time seems to be too long, but they couldn’t have had the deacon lurking about either . . . Anyway, in Alien Covenant: Origins we learn that the company called Weyland Corporation has merged into Weyland-Yutani Corporation before The Covenant sets off. They also know that Sir Peter Weyland is dead, and there is a terrorist group not wanting the Covenant mission to come about. After lots of trouble, The Covenant finally sets off somewhere between 2094 - 2104. According to FANDOM, W-Y merged 2099 which would mean that The Covenant set off probably somewhere between 2099 and 2103 (it would probably take at least 1 year to get to Planet 4)? One more thing, according to the novelization, Ricks says it would take "a couple of weeks" to get from where The Covenant had the accident to Planet 4. "According to FANDOM, W-Y merged 2099"
According to Fox. Ref. Weyland-Yutani Report. I would certainly say its a Logical/Plausible Merger Date that sites right down the middle of the events of Prometheus and Alien Covenant. I have not read the Yutani Report, a main reason being and no disrespect to everyone involved, but i was kind of waiting until the Prequel Saga was complete, then hoping that we get a Updated Report, the main reason for this is i am just one of those who hold out for something complete, so i tend to pick DVD's up if they are cheap, rather than buy each new movie that i suspect is part of a series... for example... i have no interest in getting The Last Jedi, but once we have the SW EP7-9 Box-set i would get that. Also Alien Colonial Marines, but i also think even as Canon as far as the movies the Franchise is a bit of incoherent, inconsistent mess at times, due to not sticking to any laid down LAW or Logic and Constantly Evolving Plot. Hopefully the so called ALIEN Bible has a Foundation that the Future Franchise movies and games can follow and not contradict each other. I am not sure where the 2099 Merger came from (Comic, Book, Game) but i think its pretty logical, and it certainly fits well within the movie Franchise. Regarding when this means the Covenant mission was due to leave, i cant be sure because i have not Read the Origins Novel. I am not convinced the Mission happened shortly after the Merger, we do know that THEY (Daniels and Branson) had been planning this mission for 10 years, so Origae-6 had been surveyed prior to any Merger. The only logical dates i can come up with, would be to consider the 7 more Charge Cycles over the remaining 88 Month Journey, which means if the Neutrino Burst Accident? occurred during its first charge then this means indeed a December 2103 to January 2104 date seems a good Estimate. I will have to look at the individual Messages Home Virals and see if they have any clues that we can Gauge a potential Covenant Departure Date from. I will add that a lot of confusion does seem to come from how the movies are Edited and Cut, which present ourselves with clues which could lead us down the wrong path, and even if they lead us to the right kind of path at the time.... future movies can totally ignore/mess with clues set prior. Where we can only try and come up with a Logical Explanation... and in this case, there really is very little... apart from the PURE Coincidence of finding it in the Prometheus Wreckage... otherwise HOW would this get to the Life-Boat? But this is when we look at David in Alien Covenant and could then ponder if David had taken it at some point prior to the 3rd act in Prometheus, and it ended up in the Lifeboat via David prior to Dr Shaw and the Crew going to awaken the Engineers.... which kind of could allow us to ponder that David took it because he was at this very early stage INFATUATED with Dr Shaw. So its examples like that, where we can only try and find rational explanations, when we have no hard facts... which is also why i am drawn to the Hair Length indicating that Dr Shaw had spent 10-12 months from the end of Prometheus until David tucked her away in The Crossing. However there is never any confirmed time-frame of such events... and it could be another Ridley Scott/FOX Oversight? "I am not sure where the 2099 Merger came from (Comic, Book, Game) but i think its pretty logical, and it certainly fits well within the movie Franchise." The 2099 date was arrived at when the Weyland-Yutani Report was being developed.